Special guest: Wendy Myers is a functional diagnostic nutritionist and toxic metals specialist. 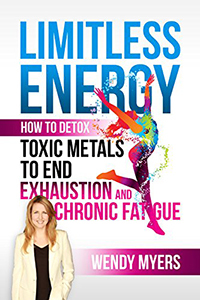 She is also the author of Limitless Energy: How to Detox Toxic Metals to End Exhaustion and Chronic Fatigue. Through her book and her “Live to 110” podcast, Wendy explains how to safely reverse damage from toxic metals and reclaim energy once again. Passionate about the importance of detox to live a long, disease-free life, she created the revolutionary Myers Detox Protocol after working with thousands of clients. Dr. Daniel Nuzum was born and raised in a family of naturopaths. He was his parents’ only biological son, but when he was 7 years old, his parents started adopting children; over time they adopted 32 kids, most with special needs. This is where Daniel’s love for natural medicine began, as he watched his mother make the necessary dietary changes for each child. Alternative medicine came naturally to him and when he received his license at the age of 20, he became the youngest licensed naturopath in US history. Dr. Nuzum is a Doctor of Osteopathy, Naturopathy, Naprapathic Medicine, and a Medical Acupuncturist, and has been formulating his own line of nutritional supplements for many years. Dr. Kevin Passero and his special guest Anthony DiClementi will discuss uncommon strategies for improving energy and mental focus. Anthony DiClementi, CNS, NCSF-CPT, is an executive health and fitness coach, as well as a specialist in functional medicine. He teaches uncommon strategies to improve energy, cognition, mood, fat loss and physical performance. Anthony and his team of experts have assisted clients worldwide in overcoming chronic and degenerative conditions, where more conventional approaches have failed. Dr. Kevin Passero and his special guest Eve Prang Plews will be discussing how to live a healthier life in a toxic world. Eve Prang Plews, LNC, IFMCP, is a founding member of the Xymogen Medical Board of Advisors. Eve has practiced in her clinic, Full Spectrum Health in Sarasota, FL, for 26 years. Her training includes medical botany and homeopathy five-element theory, as well as functional medicine. She is a graduate of The Institute for Functional Medicine, and is one of 124 U.S. practitioners to have earned the title of Institute for Functional Medicine Certified Practitioner (IFMCP). Eve regularly hosts two radio shows on various health issues. The Unhealthy Truth: How Our Food Is Making Us Sick and What We Can Do About It. Join host Dana Laake and her special guest Robyn O’Brien, author of The Unhealthy Truth: How Our Food Is Making Us Sick and What We Can Do About It. Robyn O’Brien is an author, researcher and mother of four who has leveraged her experience as a food industry analyst to expose how failed federal policy and exploitative financial incentives have accelerated the toxicity of the US food supply. Robyn is the founder of AllergyKids Foundation, an organization designed to protect American children with allergies, autism, ADHD and asthma from chemicals in the food supply. She is a sought-after expert on children’s health policy.